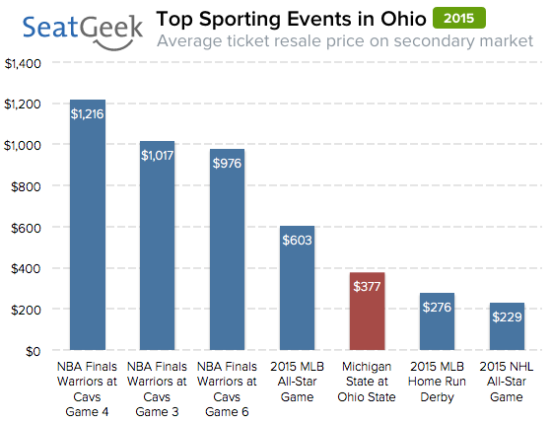 With an average resale price of $377, this weekend marks the second most expensive Buckeyes home game since 2010, when SeatGeek started tracking the secondary market. The only hotter ticket was a matchup with Michigan in 2010 that had an average resale price of $388. In fact, this weekend’s matchup between the two Big Ten schools is currently the fourth most expensive regular season game in college football this season. Since 2010 Ohio State has had 10 games at Ohio Stadium with an average resale price of more than $200, but only one has a higher average resale price than the $377 for this weekend’s game. That was the November 27 matchup between Michigan and Ohio State, which had an average resale price of $388. Ohio State has the second most expensive tickets in college football this season, with an overall average resale price of $190. This only trails Notre Dame, which has an overall average resale price of $267. Fans who have waited until now to buy tickets may be able to save a bit of money. The median listing price for the Ohio State-Michigan State game was $465 a month ago, but is currently $360, a drop of 23 percent. The get-in price (or cheapest ticket) has gone from $264 to $180 over the same timespan. Interestingly, the Ohio State-Michigan State matchup is the fourth most expensive regular season college football game this year, but not even the most expensive game of this weekend. That distinction belongs to the Notre Dame-Boston College game at Fenway Park Saturday, which currently has an average resale price of $637.